DUMBARTON'S bogey team from last year, Ayr United, came back to haunt them in a Betfred Cup group E match on a sunlit evening at rhe YOUR Radio 103FM Stadium. DUMBARTON'S bogey team from last year, Ayr United, came back to haunt them in a Betfred Cup group E match on a sunlit evening at the newly-renamed YOUR Radio 103FM Stadium. Ian McCall's full-time side, determined to bounce back to the Ladbrokes Championship this season, had already beaten premier side Kilmarnock, and they showed real quality in winning 3-1. Sons had a number of chances to go ahead in the first half hour, but on 36 minutes Ayr grabbed the initiative with an opportunist goal. Ex-Son Andy Geggan drilled in a dangerous ball which Dumbarton defender and skipper Andy Dowie could only turn into his own net. It looked as if the home side had drawn level on 44 minutes, but Christian Nade's header went just over the bar. But the big striker — pictured shooting over the bar — well and truly made up for it two minutes into time added on, powering in the ball from another header which left the Ayr keeper scrambling. Starting the second half on level terms at 1-1, both sides were urgently looking to get in front. On 58 minutes Craig Barr seemed to have given Sons the lead, but the referee blew for a foul in the build-up. Ayr went in front again on 72 minutes with a great strike from Declan McDaid. His powerful, long-range effort moved and dipped before flying past keeper Scott Gallacher for 2-1. 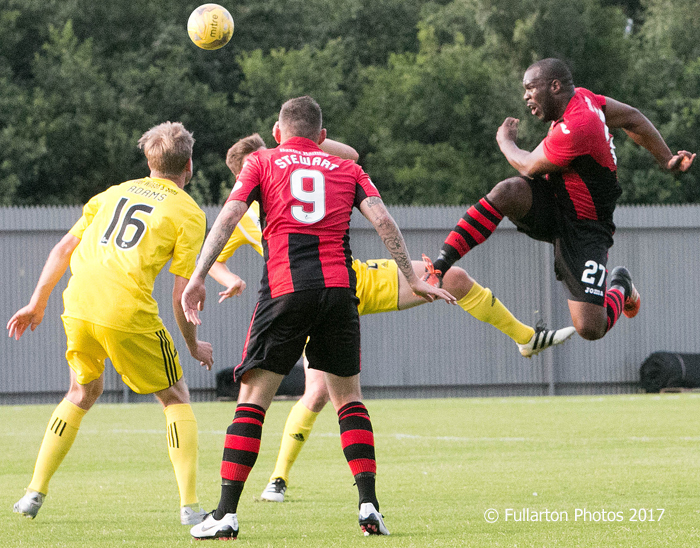 The visitors looked for a further goal to kill off the game, while Dumbarton set about trying to find an equalizer. Unfortunately for Sons it was United who found a way through again. On 87 minutes Rab Crawford cut in from the left and fired the ball into the far corner. Calum Gallagher nearly provided a consolation goal in the final moments, but his header hit the bar.